As you all know, a few weeks ago I announced that I was participating in the CrossFit Open. I started the Open as a scaled athlete, but as it turns out I was able to do the last two workouts Rx’d (as prescribed). Each workout had its difficulties and I am so proud to say that I participated. Complete in 4 minutes or under to move to next round. Number of squat cleans reduces by 2 reps and weight increases by 20lbs each round you advance to. Number of squat cleans reduces by 2 reps and weight increases by 30lbs each round you advance to. Doing the 2016 CrossFit Open was such a great experience! I never expected to do any of the workouts Rx’d, let alone two of them!! Since I made the jump I was automatically ranked as an Rx athlete which is kind of cool. I am happy to say that in my division (Canada East) I ranked in the top 48% and Worldwide I am in the top 42%. To me that is a HUGE accomplishment and gives me a great starting point to beat next year!! 16.5 – Willing myself to pick up that bar & top of my thruster at Crossfit Potcake in the Bahamas! Only 11 more months until next years Open! D and I are going to be training hard this year! Congrats to everyone that participated. 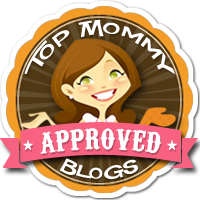 Help me become a top rated Mommy Blogger! If you enjoyed this post, click the Top Mommy Blogs button in the sidebar or below! If you clicked, you voted. A few months back I did an eat clean, train dirty post on doing crossfit throughout my pregnancy. Check out the that post by clicking here. I am happy to report that at 34 weeks I am still trucking along, but have come up against a few challenges that I didn’t really anticipate earlier in my pregnancy. 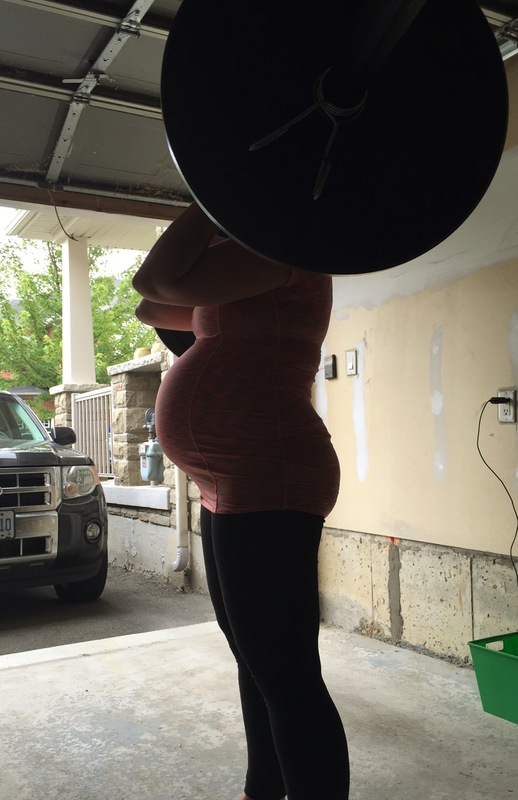 So everything is in one post, here is a short recap of how I have continued to enjoy crossfit throughout my pregnancy. For the most part I feel like once your belly arrives in the second trimester the changes into the third are not huge, just everything becomes a little bit harder each week. One thing I really didn’t foresee was how bad the feet (and hand) swelling would be. 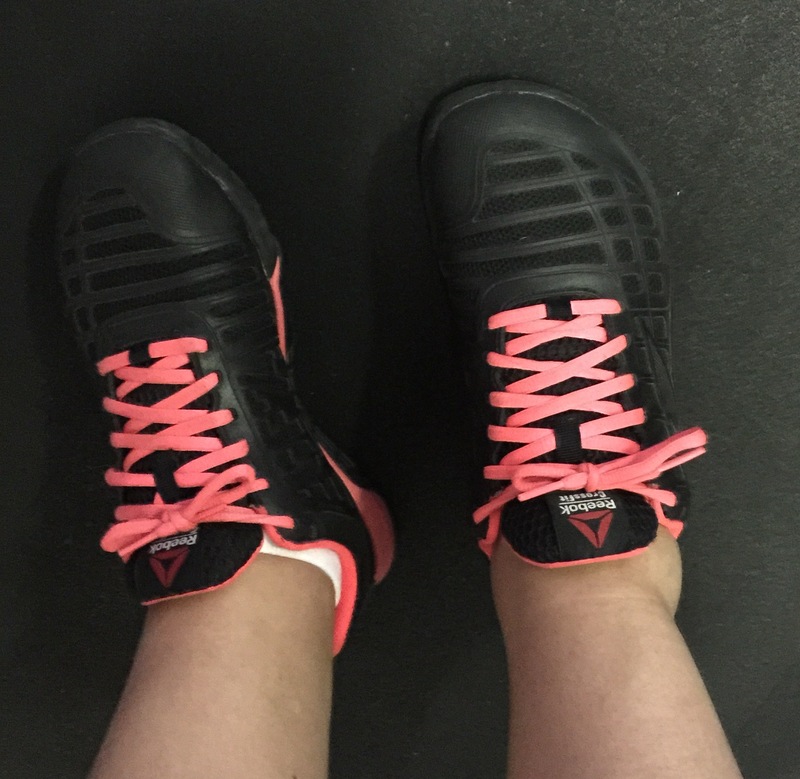 Last week it was a bit painful to grip the bar (because of wrist/hand swelling), but I found throwing on some wrist wraps really helped and… then there was the shoe struggle. I currently JUST fit into my shoes. Of all the obstacles while trying to keep fit during pregnancy, I never thought this would be the one that really stumped me! Anyway, I hope this helps anyone who wants to continue crossfit throughout pregnancy. It has really helped me and if you are able to, I highly recommend it! Happy training everyone!! Bars & Bellys – posing at the top of a hang clean. Snug fit & swollen ankles.